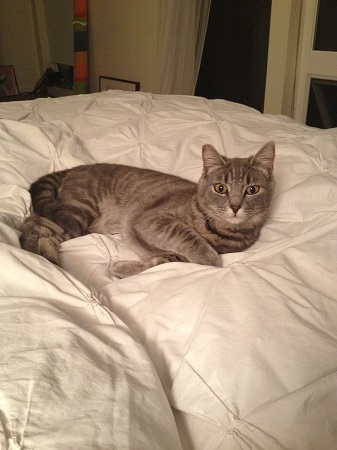 “I am excited to tell you that Z is a companion cat at last! She now allows me to stroke and pet her, and even pick her up. I can scratch her chin, give her love pets, and play with her. She is not a “lap cat” yet, and prefers to sit beside me on another couch in the evenings, but I’m confident that will change. She’s a sweet girl, she has a chirping meow that she uses liberally when she’s around. She follows me everywhere, and prefers to be in the same room with me all the time. She’ll snooze under the bed for a serious nap, or at my feet in my office. She’s starting to purr too! She’s still a tiny bit skittish, but not really afraid. Workers who have been here have not rattled her, and she’s curious about any open cupboard or door. If you’re a light sleeper – Z is the cat for you. She doesn’t want to be up on the bed (tho she will jump up for treats, and has just started to hang out for a little while with me). At night she likes to be in a little cave I’ve created for her out of a laundry basket with a blanket in it and a scarf over it so she can hide. She sleeps there every night on the floor of my room. Adorable. And it meets her need to be hidden or covered. What do you think? Want a playful and sweet companion? Fill out an application at pixieproject.org so we can schedule a meet and greet! I am fixed, vaccinated and microchipped. My adoption fee is $100 and I am currently living in foster care.